The Sign Syndicate March 2017 Video Update. Insurance, The Sign Life, Sign Bulbs and of course The Hall of Shame! It really should make you wonder when you have a LED Sales rep / Lighting Engineer talking to you over the phone trying to sell you their LED's who are a Sign Company NOW also branching out to sell their LED's which I think everyone has seen in all the sign magazines now where they ship you off their little "light box". I'm sure you know who I'm talking about. I asked him where their LED's are being made, "China...they're the brightest....with very little light decay and will last 11 years" he replied. "I see........Uhh..who is the diode manufacturer?" I replied "I Can't tell you" he said. "You don't know?" I followed up with. "No, I know....I just can't release" he said. "Why is that?" I asked. "It's proprietary information...it's our secret sauce formula you know?" "It's a secret?....that makes me cautious actually. As you know there are a lot bad diode manufacturer's and grades of each Diode......that doesn't make me confident in not knowing who you are using" I ended our conversation with. For a LED product manufacturer not to tell you who they are using is NOT good, it also should tell you their not that confident either. It means you will be retrofitting your customers signs out shortly after! I'm VERY confident and PROUD to tell you what diodes we have in our products, Samsung and Nichia! Finally we can also proudly say that these products are NOT made in CHINA!!!! We're doing WAY better than expected on the NC LED HLC Series that we can't even keep up with the demand so as of right now there is no HLC2 stock in America, LoL (Plenty of HLC3 & 4) I want to give a big sincere thank you to all those of our existing customers who have dared to try something new, once you did like myself there was no going back....sort of like coming into this industry, once you're in it's very hard to leave or go another direction. It' the growing pains we and NC LED are going through, we're asking for more than they can pump out and they had to grow with the American demand of an awesome product! More an more will be produce, and as of right now I'm having a few cases over nighted direct from Korea to ease the demand until the rest come by boat in a normal shipment which takes 2 weeks normal ocean travel. Anyhow, it's been a learning experience and I can't tell you how excited I've been bringing in a superior product, helping in it's configuration as a premium product to meet the demand for a high-end light source and for High-end customers. It's been an experience to see this go from an underdog product in our testing so many years ago to dominating the competition with their claims of "the brightest....the best.....the longest lasting" So many 6500K LED modules that never looked like a true white, the quality of NC LED is amazing an it's an amazing ride that I never want to get off of. Check out the lineup comparison below, yes....ALL supposed to be 6500K!!!! We will be doing better in availability and the quality will always be there. Go #TeamNCLED NOT Made In CHINA!!!! Just a small pre introductory thread for the new NC LED Floodlights we will be stocking along with their LED modules that we have been carrying for channel letters and cabinets. These are the new 50 watt LED Floods. These will be arriving here at the end of the month but I did a advance demo for a club here in San Diego that wanted to get rid of the conventional lighting and move towards something smaller and compact and not seen during the club hours. We set one up a 220v version, but these will be 120, and set up side by side with the existing fixtures these held up. They were very impressed that such a small unit put out so much light. So thirty of these will be purchased in advance for a more concealed light that will turn on as the club closes to get the patrons the hell out and start clean up These will only be $52.99 each, and they pack a punch! We will also be bringing in some larger NC LED under canopy lighting as we get into more general lighting products as well as fixtures commonly used for gas stations. The big plus about any NC LED products is, their Korean, their known quality products along side with that high quality control, and their NOT made in China! The Assault of our "Traditions" In another topic I started a week back or so is below but now I'm continuing in a new thread, because...jokes aside. http://www.thesignsyndicate.com/forums/index.php?/topic/6677-pillsbury-dough-boy-makeover-and-93-saving/ Something big has changed, a more understanding behind the news article. A look into "Sign Mythology" See Sign Proposal from Lawrence Sign below: wcms1p-122428.pdf It's not very often, but I just read this a short time ago and I have to say my stomach dropped, you know that sick disgusted feeling you get right there in the center of your stomach? I'm attaching a document that was made public on another site thanks to Mike for making it public. If this doesn't sicken everyone in the electric sign industry I don't know what will, and this should. There is something that everyone in the electric sign industry should uphold no matter what light source you prefer or what your opinion is on applications. I'm speaking about upholding our traditions, and never giving them up to mis-characterization and mis-information. Neon has been around for a long time and there a place for it like everything else in life based on it's own merit and function in upon which it serves. Neon is also a tradition, OUR tradition no matter what you produce in this trade! 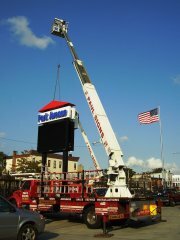 You may have not been in the electric sign industry for a long time, you may be relatively new, and you may have never even touched, fabricated or installed any before ever. But that should not keep you from appreciating it's function and pure elegance. Right now it's being assaulted, mis-characterized, and outright LIED as a whole, just to make a buck for something that will not last as long as it can. There is a time and place in everything when it comes to the electric sign industry but Flexible LEDs should NOT be used to replace a historical sign, especially when the person doing the push sell of a repair or retrofit is doing so with false information and mis-leading the buyer. Well, that's what Lawrence Sign is doing right now. It's one thing to read an article online or in a newspaper, it's another to see a proposal from seller to buyer in print with false information which does nothing but desecrate and annihilate our traditions, that they themselves are apart of. LED Flex Strips do not have usable light at 100,000 hours. Red LED's degrade in light, Red pumped Neon does not. Red neon does NOT consume 20 WATTS per foot, that's ABSURD!!! That diameter neon lamps for that size project consume 3 to 3.5 watts per foot. it does not take $15k a year in cost of operation vs $1,000 a year to convert over to LED Now that we have a real proposal to go off of we can calculate/estimate the cost of operation. We can estimate that with the 11' letters have approx 93 feet of Neon (3 rows inches x 8.5), the lowercase and small capitals have 56' of lamps = 1,258' of lamps 1293' x 3 watts per foot = 3,774 watts 3,774 watts x 12 hrs x 365 days a year x $.15kwh / 1000 PC = $2,479.50, NOT almost $16,000 in annual cost of operation ​When it comes to the supposed "Yearly Maintenance" I don't even have a comment on that part, it just gets more ridiculous. If hail is a big concern for breakage then clear polycarbonate can come in real handy. So can hinge system. A Industry as a whole, this sign trade needs to care no matter what your preference is and how long you've been in this industry, as someone new to it, 2nd, 3rd generation....otherwise we will loose a big part of who we are and we shame those who came before us, we shame those who started our grand traditions. It won't come from our leadership in the form or associations, their just as guilty if not enablers of mis-information and mis-characterization of our traditions. The trade magazines? Just as bad, only trade magazine that actually reports now and IS "journalism", is "Signs of The Times". In the end, it's about how you and I conduct OUR business, how we sell to our clients, and how we want our "Signs" left behind. We're forgetting why we came into this industry, what it is to look back at something long after we put it up, long after. Lately it's just been bastardized by outsiders who just want to take our trade and traditions and turn it into a cheap commodity all because THEY have something THEY want to sell to us, we can even go a step further to say what THEY want force on us and what THEY want forced upon the end user. Integrity - To do what's right and not what comes easy, even when no one is looking. Traditions - It's who we are, and what we want to pass on to those after us. I'm sending a notice to all that I'm going to be trimming down on our testing and purging a lot of LED products that are either out dated or the manufacturers are no longer vendors here. Currently we have just too many and a lot are out dated and some of those companies have downsized or pretty much non-existent, or I just no no desire to pursue them since their either not widely used or advertised as much as they used to be. I'm going to keep the mainstream guys because well, that's who a lot liek to watch and observe to see if their products last as long as they claim in the full sized magazine page ads say it does, like GE, USLED, Agilight, Sloan, and probably Sylvania / Osram. All others unless their vendors from this site I'll be tossing those out, I may keep some smaller vendors around but I'll pay that by ear. Anyone know if Permlight is still around? Haven't seen them at a show for awhile now and not sure if they even advertise in magazine anymore. So, if you're not one of the named above, shoot me over a message if you still want to stay on board, otherwise the "Purge" is coming to make room for others in the following tests The Great White Hope II Project Tighty Whitey The Red Light District Blue Light Special Nothing will be changing for Border Security, maybe just drop one or two. Thanks!